I’ve been to quite a few writers’ conferences over the years, but this was my first SCBWI, and I had a fabulous and productive time. I nearly filled a whole notebook with madly scribbled notes. The full day “intensive” on Marketing for Professional Writers was unbelievably overwhelming. My head was ready to explode by lunch. And that day ended with drinks with my agent and the impressive and witty Jon Fine from Amazon Publishing. Now it’s time to sit back and prioritize. For now, here are some of the fun highlights — just the ones for which I have photographic evidence. 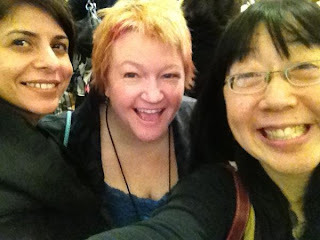 Here is the fabulous Mahtab Narsiman, moi and multi-talented Debbie Ridpath Ohi. All of the speakers at this conference were unbelievably high quality, but one fun unscheduled treat was a short presentation by Henry Winkler who writes middle grade novels with SCBWI founder Lin Oliver. Here’s bad and fuzzy photo I obnoxiously took of him when I accidentally ended up standing beside him waiting for the elevator. I should have said hello and asked permission, but didn’t want to pass up on the opportunity. My apologies to Henry. After the conference, I did a little chill-axing at the MOMA before taking the train to Newark airport for my flight home. Didn’t have nearly as much time there as I would have liked, but stopped for the best cup of hot chocolate I’ve ever had. What you can’t tell from this photo, was that it was hot in two ways… and spiked. I can’t remember all the ingredients but the key ones (beyond hot chocolate) were tequila, chilli flakes and cinnamon. Yum. That’s a stick of cinnamon sticking out. Talk about spicy. Burned going down, in many good ways. I will talk more about the content of the conference both here and at Drunk Writer Talk soon. How fun! I joined SCBWI when I tried my hand at writing picture books but that phase didn’t last long – although my picture book is now a family souvenir in honor of our cat Skipper. I didn’t realize they had grown into edgy YA, too! How FAB for you! YA has way more in common with adult fiction than picture books, IMHO, but yet it’s Children’s. One of the keynotes was by Cassandra Claire who I think of as a romance writer… or maybe urban fantasy, more than “children’s”.